Love in 1 Cor 13 is “agape” in Greek, a particular kind of love that is hard to translate into English. Sacrificial love, perhaps, or the old word “charity.” It is love that bears all things for the other. Is any passage of Scripture better known or more heard except perhaps Psalm 23? This is a beautiful passage—Paul at his best. It is popularly read at weddings, but its original context and intent had nothing to do with marriage. The Corinthians were a conflicted community. Paul has been working at this from several angles ever since the letter began. Finally, at the end of chapter 12, he says, “but strive for the greater gifts.” Then love is revealed as the greatest of them all. 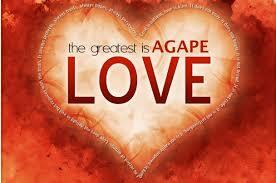 Love here is “agape” in Greek, a particular kind of love that is hard to translate into English. Sacrificial love, perhaps, or the old word “charity.” It is love that bears all things for the other. 13:1 If I speak in the tongues of mortals and of angels, but do not have love, I am a noisy gong or a clanging cymbal. 2 And if I have prophetic powers, and understand all mysteries and all knowledge, and if I have all faith, so as to remove mountains, but do not have love, I am nothing. 3 If I give away all my possessions, and if I hand over my body so that I may boast, but do not have love, I gain nothing. 4 Love is patient; love is kind; love is not envious or boastful or arrogant 5 or rude. It does not insist on its own way; it is not irritable or resentful; 6 it does not rejoice in wrongdoing, but rejoices in the truth. 7 It bears all things, believes all things, hopes all things, endures all things. 8 Love never ends. But as for prophecies, they will come to an end; as for tongues, they will cease; as for knowledge, it will come to an end. 9 For we know only in part, and we prophesy only in part; 10 but when the complete comes, the partial will come to an end. 11 When I was a child, I spoke like a child, I thought like a child, I reasoned like a child; when I became an adult, I put an end to childish ways. 12 For now we see in a mirror, dimly, but then we will see face to face. Now I know only in part; then I will know fully, even as I have been fully known. 13 And now faith, hope, and love abide, these three; and the greatest of these is love. We are joining a story in the middle with this reading. Jesus is in the synagogue in his hometown, Nazareth, and has read a passage from Isaiah about proclaiming good news to the poor, release to the captives…the year of the Lord’s favor. He sits down, and then our reading begins this morning. His commentary on the reading is brief but provocative, in particular that word “today.” Many take offense. He seems to be acting more important than they “know” he is. Jesus rubs salt in the wound by talking about the acceptance by God of two Gentiles (see 1 Kings 17:8-16 & 2 Kings 5:1-14). Jesus is questioning the “special relationship” they believed they had with God. 4:21 Then Jesus began to say to them, “Today this scripture has been fulfilled in your hearing.” 22 All spoke well of him and were amazed at the gracious words that came from his mouth. They said, “Is not this Joseph’s son?” 23 He said to them, “Doubtless you will quote to me this proverb, ‘Doctor, cure yourself!’ And you will say, ‘Do here also in your hometown the things that we have heard you did at Capernaum.’” 24 And he said, “Truly I tell you, no prophet is accepted in the prophet’s hometown. 25 But the truth is, there were many widows in Israel in the time of Elijah, when the heaven was shut up three years and six months, and there was a severe famine over all the land; 26 yet Elijah was sent to none of them except to a widow at Zarephath in Sidon. 27 There were also many lepers in Israel in the time of the prophet Elisha, and none of them was cleansed except Naaman the Syrian.” 28 When they heard this, all in the synagogue were filled with rage. 29 They got up, drove him out of the town, and led him to the brow of the hill on which their town was built, so that they might hurl him off the cliff. 30 But he passed through the midst of them and went on his way. The Scripture quotations (except for the psalm) are from the New Revised Standard Version Bible, copyright © 1989 by the Division of Christian Education of the National Council of Churches of Christ in the U.S.A., and are used by permission. All rights reserved. The Psalm translation is from The Book of Common Prayer. Commentaries are by Epiphany ESources, E. Main St., Hornell, NY 14843, www.epiphanyesources.com , copyright © 2018. All rights reserved. Permission is given to copy for group study, with attribution. Bulletin inserts are available. For more info go to our webite.